Prof. Ashwini K. Agrawal was awarded the Abdul Kalam Technology Innovation National Fellowship by the Indian National Academy of Engineering on behalf of Department of Science and Technology, Government of India for a period of three years commencing February 1, 2019. The award was for his proposal to carry out work on the topic of "Next Generation Filtration Devices for Protection of Environment and Health". The award was given to Prof. Agrawal to recognize his outstanding contributions in the field of Smart and Functional Textile Materials.The award was instituted with the objective of recognizing translational research by individuals to achieve excellence in engineering, innovation and technology development. We, at SMITA Research Lab, bid a bittersweet farewell to Dr. Deepika Gupta on 6th November 2018 as she left the group to join Grasim Industries, Aditya Birla Group as a Scientist in the Pulp and Fiber Unit. She had joined the SMITA Research Group in 2008 as a Project Associate. She later joined as a PhD scholar in the lab the following year. She worked successfully in the area of electrospinning and completed her thesis titled 'Influence of Solution Properties on Electrospinning Behaviour of Biocompatible Polymers' in 2016. For her work in the area she received a certificate for outstanding contribution in the are of Electrospinning of bio-polymers. She was also awarded a certificate of appreciation for making an outstanding contribution for collaborative research in Textile scaffold based tissue engineering, to acknowledge her work in collaboration with AIIMS, New Delhi. After completing her PhD, she joined the group in the role of Research Associate and worked on electrospinning for air filter applications using her depth of electrospinning knowledge. She was awarded a certificate for outstanding contribution for Technology transfer for nanofibers. As a senior member in the lab, she was also awarded outstanding contribution for Mentoring research projects in SMITA group. After a successful journey spanning almost ten years in the lab, we wish her all the best for her future endeavours roles. Dr. Raghav Mehra successfully defended his thesis titled 'Hydrophobic functionalization of cellulosic substrate using atmospheric pressure pulse plasma' on 11th October 2018. His viva was supervised by Dr. Anjan Mukhopadhyay, Director, BTRA, Mumbai and his SRC members. (L to R) Manjeet Jassal, Anjan Mukhopadhyay, Ashwini K. Agrawal, Samrat Mukhopadhyay, Bhuvanesh Gupta. The next day Dr. Mehra celebrated the completion of his Ph.D. by hosting a high tea party for the entire department. The event was widely attended and everyone enjoyed the snacks and tea. On the 49th Annual Convocation of IIT Delhi, held on 3rd November 2018, Dr. Mehra received his doctoral degree from Prof. V. Ramgopal Rao, Director, IIT Delhi thereby bringing a fitting close to his doctoral journey. He had previously joined Croda India Company Pvt. Ltd. in September 2017 in their R&D division. We wish him all the best for his future endeavours. Ms. Saranshu Singla, an alumnus of SMITA Research Lab from the Batch of 2012. She is currently pursuing her PhD from the Department of polymer Science at University of Akron, Ohio. She visited IIT Delhi and met the current members of the group on 22nd May 2018. Here she discussed her work on Infrared Spectroscopy for surface group analysis. She was felicitated by Prof. Agrawal and Prof Jassal with a memento of SMITA Research Lab. The farewell ceremony of M.tech batch of 2018 was held on 18th May 2018. They joined the lab in 2016 and worked in different fields of work. Ms. Aparajita Pal was awarded for outstanding contribution in "Wet spinning of hollow fibres for flexible electronics". She joined the group after completing her B. Tech. from MAKAUT, West Bengal. Mr. Getachew Zeru was awarded for outstanding contribution in "Electrospinning of functional nanofibres". He joined the group through a collaborative programme between IIT Delhi and the Ethiopian government. Mr. Alok Singh Bhadauriya was awarded for outstanding contribution in "Melt spinning of nanocomposite fibres". He joined Smita Research Lab after completing his undergraduate degree from UPTTI, Uttar Pradesh and with around a year of work experience. We hope they had a good learning experience at SMITA Research Lab and wish them all the best for their future endeavors. Ms. Aparajita Pal, Mr. Getachew Zeru, Mr. Alok Singh Bhadauriya receiveing certificates(L to R). 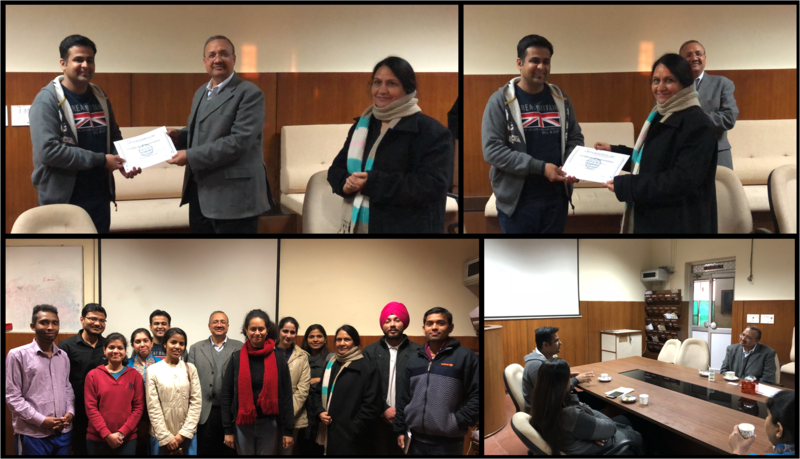 The farewell ceremony of Mr. Raghav Mehra was held on 12th February 2018. He was awarded for outstanding contribution in the research area of Plasma Reaction Engineering. He was also awarded for outstanding contribution in lab management. He also received a memento of the group from Prof. Agrawal and Prof. Jassal. Mr. Mehra joined SMITA Research Lab as a PhD student in July 2012. He joined Croda India Company Pvt. Ltd. in September 2017 in their R&D division. We wish him all the best for his future endeavours. PhD position is open at SMITA Research Lab, IIT Delhi under the Department of Textile Technology. Applications are welcome from eligible candidates with a background in Textile, Polymer Science, Chemistry, Nanotechnology, Biotechnology and related fields. For eligibility criteria of PhD applicants please check this link. Interested candidates please send your resume with degrees pursued, merit position (if any), marks, and academic/research experience at the following email addresses. The farewell ceremony of Dr. Kamlesh Panwar was held on 19th January 2018. She was awarded for outstanding contribution to the management of SMITA Chemical Lab and SMITA Analytical Lab. For her research work she was awarded for outstanding contribution in the research area of novel nanomaterials and application on textiles. Dr. Kamlesh also received appreciation for technology development and transfer of low weight flame retardant coated textiles to industry. She joined SMITA Research Lab as a Project Associate in 2009. She started her PhD programme in Dec 2010 and completed her defence in Dec 2016. After this she continued in the group as a Research Associate till Jan 2018. She is joining Resil Chemicals as Research Scientist from Feb 2018. We wish her all the best for her endeavours. The 3rd SMITA Research Symposium was held on 19th January 2018. The programme schedule and photographs from the award ceremony are shown below. The event was hosted by Ms. Gurneet Kaur and Ms. Kumud Arora.